Junior membership is open to young people up to 21 years of age who have an interest in the Red Angus breed. 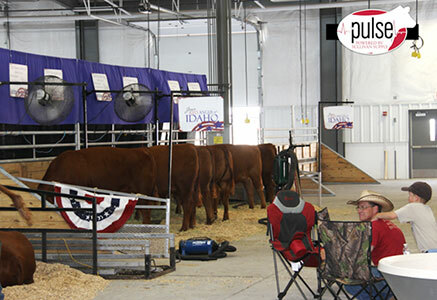 Many of these young people show Red Angus cattle at junior shows throughout Oregon, Washington and Idaho. Royce McPhee-Bayha is a 4th generation cattle rancher that lives on 350 head mother cow Purebred Red Angus operation. At just over 18, Royce has been a heavily involved showman since he began his showing career for the first time at the Red Western classic at just 8 years old. Royce currently owns a herd of 24 mother cows, and continues to focus on raising performance Red Angus. He has successfully consigned bulls and females to various bull tests and consignment sales across the country. He plans to grow the operation by adding a feedlot to the ranch and utilizing agriculture byproducts for feedstuffs and bedding. 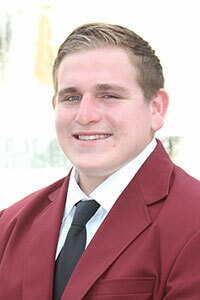 While attending CSU Chico Royce is pursuing an Agriculture Business degree, with a minor in Animal Nutrition. Junior members from 12 states and Canada met in Sacramento, Calif., for the 2014 Round-Up in June. Members of the Canadian Junior Angus Association also attended Round-Up as part of the JRA American/Canadian Exchange Program. Representing the North West Red Angus Association were: Brady Linnell, Oregon, Riley Haun, Idaho, Morgan Cortez, Idaho, Anna Miller, California, and Royce McPhee-Bayha, California. During the week of Red Angus focused activities, Anna Miller was elected to join the Officer team. We are very proud to have Anna representing the North West! Highlights of the 2014 Round-Up included stops at: Mendoza Red Angus, Valley Springs, Calif.; Awalt’s AAA Red Angus, Sanger, Calif.; Silveira Brothers Angus, Firebaugh, Calif.; Harris Ranch feedlot and Thoroughbred operations, Coalinga, Calif.; McPhee Red Angus, Lodi, Calif., Yosemite National Park and Fresno State University. Stops at Prima Frutta, an olive grove and processing facility and a vineyard were included in the tour of California agriculture. The week included all the JRA National Contests – Quiz Bowl, Team Advocacy, Prepared Speech, Extemporaneous Speech, Barnyard Olympics, Scrapbook, Print Advertising, Cattle Evaluation/Judging, T-shirt design, Poster, Stockman’s Quiz, Equipment Identification and Weight Guessing. Results from involvement in all the contests lead to the coveted Best-All-Around award presented at the Saturday awards banquet. Northwest Red Angus Juniors attending the 2014 JRA Round Up in California are from L-R: Anna Miller, Morgan Cortez, Riley Haun, Royce McPhee-Bayha and Brady Linnell. 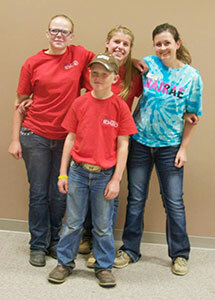 Four juniors from Idaho traveled to the Red Angus junior national show in Grand Island, Nebraska, in June. Traveling across Idaho, Wyoming, and Nebraska, the two day drive found these Idaho Juniors ready to compete! 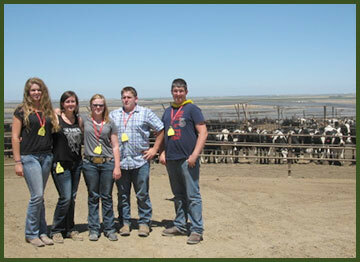 This is the third year that juniors from the North West have traveled to be a part of the NAJRAE. During the 4-day event, juniors competed in public speaking, sales talk, herdsman quiz, livestock judging, quiz bowl team competition, team fitting, photography, showmanship, bred and owned and owned cattle competition and futurity heifer show. One of the week’s highlights was the Idaho team taking home bragging rights as the Intermediate Division Quiz Bowl Champions! After the individual competition results were calculated, Idaho was well represented with Riley Haun being awarded several competition wins, and 5th high overall individual honors. NAJRAE board member Morgan Cortez also received several individual awards adding up to 8th high individual award for the week. Willy Haun also received recognition as the second place public speaking recipient for the junior division. 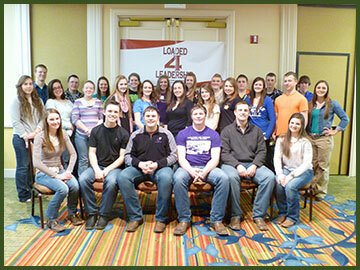 Twenty-five JRA members from 14 states gathered in Denver for the 2014 Loaded 4 Leadership (L4L) junior conference. The two-day event – focused on being a beef industry advocate, becoming Masters of Beef Advocacy and filming and editing JRA advocacy videos – was highlighted by Copperhead Road line dance and two–step lessons by a professional dance instructor and a Lunch with Leaders (the RAAA Board of Directors). Nationally recognized advocacy video producer and star, Greg Peterson of Peterson Farm Brothers in Kansas, was the keynote speaker of this year’s L4L. Greg spent both days with the Red Angus juniors, sharing his insight, suggestions and editing skills with those in attendance. Daren Williams, Candace Weeda and Michele Peterson Murray, all National Cattlemen’s Beef Association staff members, brought experience and expertise in beef advocacy and social media to the conference. Teams of Red Angus juniors brainstormed, scripted, filmed and edited their own beef and JRA advocacy videos as part of L4L. Watch the JRA e-News and JRA Facebook in the near future to view the completed videos! L4L, which alternates years with the Red Angus Young Stockman Program, will be held again in 2016. For more information on Loaded 4 Leadership, the Red Angus Young Stockman Program or other JRA programs and events, contact dawn@redangus.org.